Florentine painter, a Dominican friar, originally named Guido di Pietro. 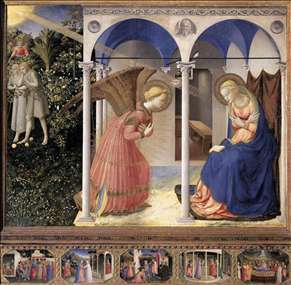 Although in popular tradition he has been seen as not an artist properly so-called but an inspired saint , (Ruskin), Angelico was in fact a highly professional artist, who was in touch with the most advanced developments in contemporary Florentine art and in later life travelled extensively for prestigious commissions. Angelico entered a Dominican convent in Fiesole in 1418 and became a friar using the name Giovanni da Fiesole. Although his teacher is unknown, he apparently began his career as an illuminator of missals and other religious books. He began to paint altarpieces and other panels; among his important early works are the Madonna of the Star (1428?-1433, San Marco, Florence) and Christ in Glory Surrounded by Saints and Angels (National Gallery, London), which depicts more than 250 distinct figures. Among other works of that period are two of the Coronation of the Virgin (San Marco and Louvre, Paris) and The Deposition and The Last Judgment (San Marco). 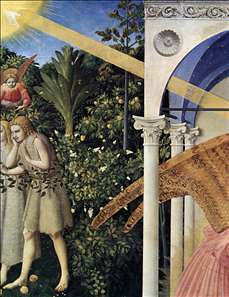 His mature style is first seen in the Madonna of the Linen Weavers (1433, San Marco), which features a border with 12 music-making angels. 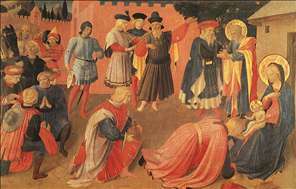 In 1436 some of the Dominican friars of Fiesole moved to the convent of San Marco in Florence, which had recently been rebuilt by Michelozzo. Angelico, sometimes aided by assistants, painted many frescoes for the cloister, chapter house, and entrances to the 20 cells on the upper corridors. The most impressive of these are The Crucifixion, Christ as a Pilgrim, and Transfiguration. His altarpiece for San Marco (1439?) is one of the first representations of what is known as a Sacred Conversation: the Madonna flanked by angels and saints who seem to share a common space. In 1445 Angelico was summoned to Rome by Pope Eugenius IV to paint frescoes for the now destroyed Chapel of the Sacrament in the Vatican. In 1447, with his pupil Benozzo Gozzoli, he painted frescoes for the cathedral in Orvieto. His last important works, frescoes for the chapel of Pope Nicholas in the Vatican, are Scenes from the Lives of Saints Stephen and Lawrence (1447-1449), probably partly painted from his designs by assistants. Angelico died in Rome and was buried in the church of S. Maria sopra Minerva, where his tombstone still exists. 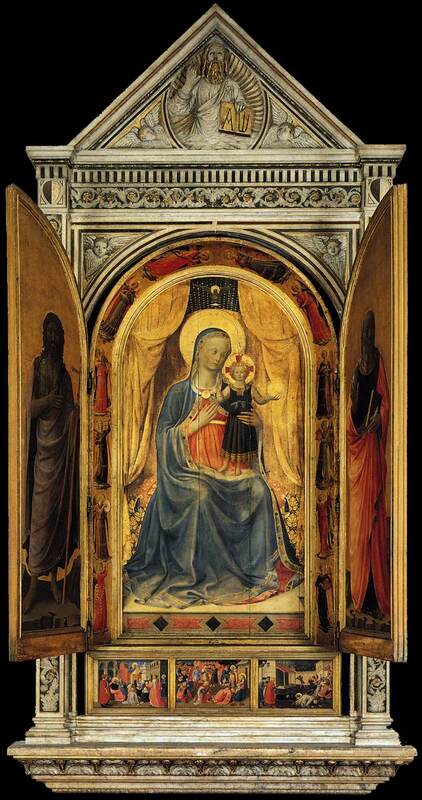 His most important pupil was Benozzo Gozzoli and he had considerable influence on Italian painting. He painted numerous altarpieces as well as frescos, several outstanding examples being in the S. Marco museum. His particular grace and sweetness stimulated the school of Perugia, and Fra Bartolommeo, who followed him into S. Marco in 1500, had something of his restraint and grandeur. 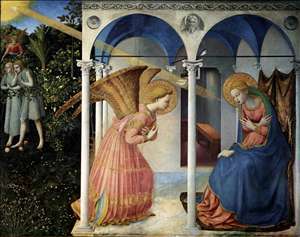 Vasari, who referred to Fra Giovanni as a simple and most holy man, popularized the use of the name Angelico for him, but he says it is the name by which he was always known, and it was certainly used as early as 1469. 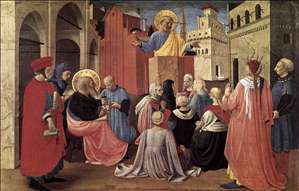 The painter has long been called Beato Angelico (the Blessed Angelico), but his beatification was not made official by the Vatican until 1984. 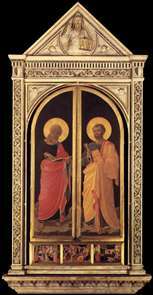 Angelico combined the influence of the elegantly decorative International Gothic style of Gentile da Fabriano with the more realistic style of such Renaissance masters as the painter Masaccio and the sculptors Donatello and Ghiberti, all of whom worked in Florence. Angelico was also aware of the theories of perspective proposed by Leon Battista Alberti. Angelico s representation of devout facial expressions and his use of colour to heighten emotion are particularly effective. His skill in creating monumental figures, representing motion, and suggesting deep space through the use of linear perspective, especially in the Roman frescoes, mark him as one of the foremost painters of the Renaissance. See more details about "The Annunciation"
See more details about "The Annunciation "
See more details about "Linaioli Tabernacle (shutters closed)"
See more details about "Linaioli Tabernacle (shutters open)"
See more details about "Linaioli Tabernacle "
See more details about "St Peter Preaching in the Presence of St Mark"
See more details about "Adoration of the Magi"